No video with this lesson - listen to the soundfile. This is probably one of the best bits of technique you can add to your repertoire. It involves sliding down a tone (or semitone) quickly then damping so you don't hear the slide coming back up - you then hit another note at the fret you started on. 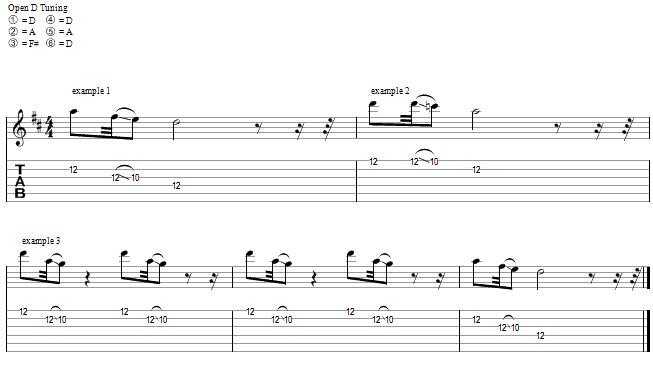 The soundfile has a few examples all played at the 12th fret. The hardest thing here is the right hand damping which you need to practice slowly. Drag down - Damp - Move back without a slide up sound. Once you have the damping synchronized as part of the phrase it should be easy to speed it up.